This alluring timepiece in black and gold tone is designed by leading fashion designer Michael Kors for impeccably stylish ladies. A gold tone bracelet and round case contrast beautifully with the black chronograph dial featuring gold tone roman numerals and hands for a truly luxurious feel. 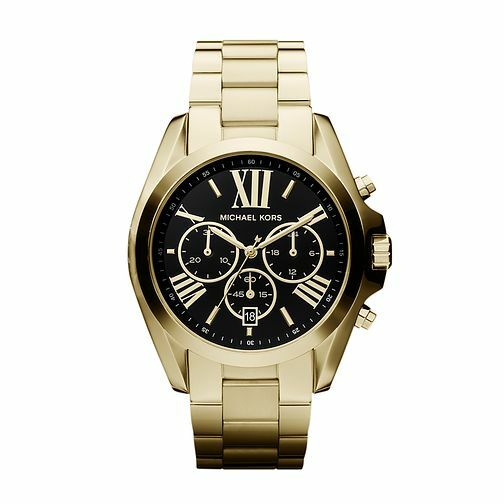 Michael Kors Ladies' Gold Tone Chronograph Bracelet Watch is rated 5.0 out of 5 by 1. Rated 5 out of 5 by Anonymous from LOVE I got this watch as a present for my birthday! I have several Michael Kors watches but this by far is my favourite! I prefer chunky watches that make a statement and this is exactly it! It's bold and beautiful! LOVE IT!